Founded in 1896, American University Washington College of Law has evolved to meet the changing needs of legal education. Designed to provide access to new experiences, the facility emphasizes collaboration, skills development, interaction with the public and legal community, and active participation in specialized programs. Its new home on AU’s beautiful Tenley Campus at the intersection of Nebraska and Wisconsin Avenues in Washington, DC enhances the institution’s rich tradition of innovation, excellence and passion for the rule of law in the United States and beyond. 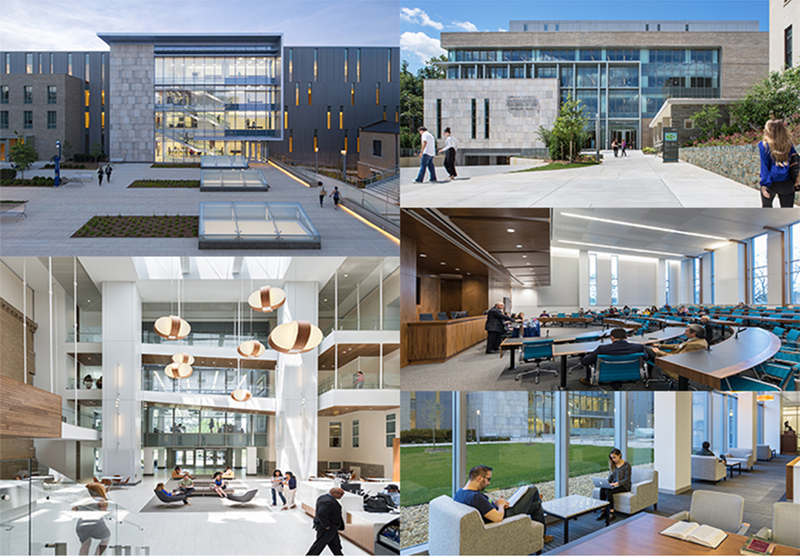 The 312,000 square foot facility is configured to define a prominent identity for American University Washington College of Law while honoring the legacy of the site, designated as a National Register Historic District. The 1904 - Capital Hall, 1921 - Chapel and circa 1839 - Dunblane House contribute to the campus’ historic character. For its 1,700 students and 430 faculty and staff, the new and renovated buildings form a connected complex of teaching spaces, conference facilities, legal clinic resources, teaching courtrooms, law library, alumni center, faculty and staff offices and multiple student study/meeting spaces. Outdoor spaces include a central quadrangle and an accessible front lawn that provide opportunities for interaction. The facility achieved LEED Gold certification by the U.S. Green Building Council and among its sustainable features is a progressive and energy-efficient dedicated outside air system (or DOAS) radiant heating and cooling mechanical system. Construction commenced in June 2013, and the facility opened for its first class in January 2016. Whiting-Turner is the Construction Manager and SmithGroupJJR is the architecture/engineering design firm.